You know those people who say “My favorite part of my day is my bike commute?” Yeah, I bet you do. They’re giving me a headache. Lately, my around-town riding has been mostly uninspired. I love my bicycles and every moment I spend on them is a treat in some way, but my weekday city riding has been more chore than pleasure. Today all the cars were out trying to shove themselves in my space while all the bike commuters raced me (and won). Sometimes the commute has an energy like that, especially during the early summer and before the dog days slow everyone down. My scenic route is still crowded, but gives me additional time to ponder my existence as I gaze out over the Potomac River, which is quite pretty to look upon as long as you don’t think too much about what’s in the water. 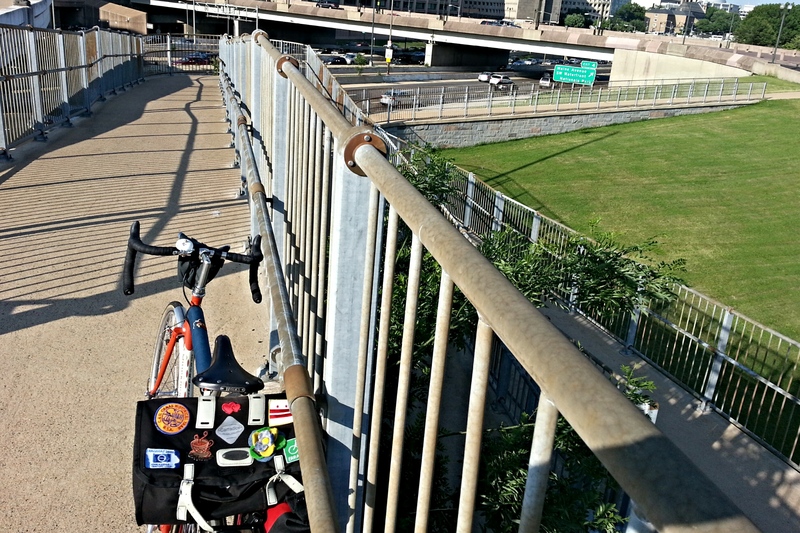 One segment I have added to my route is a flyover path across the Washington Channel from Ohio Drive that terminates at two abrupt hairpin curve descents that then release the rider onto the sidewalk/street at Benjamin Banneker Park near L’Enfant Plaza in Southwest D.C. I have never ever managed to make the right hairpin without putting a foot down. In the beginning of April I told myself that I would make that turn a little skills project. I’d keep working on the curve until one day I would not pad my way around it. Whenever I attempted the right-hand hairpin turn, I put a lot of focus into it. Probably too much. Felkerino would tell me to swing wide and cut right, but I could never convince my bike to follow that instruction. As I rode over the Washington Channel today I found myself alone and grouchy. A voice inside me said I was going to make it around the hairpins foot-free. I agreed and told the voice that if I ran into the gate and fell over in my attempt, well, that was just fine. It would be a fitting end to a commute. But that is not what happened. Following Felkerino’s advice, I swung wide to the left and cut sharp to the right. I saw the gates of the path in front of me and I held myself steady as I continued to swing my bike sternly around the turn. And. I. Made. It. What a glorious shock. I smiled from ear to ear and zipped my Quickbeam around the left turn. Victory! Was it a fluke, I wondered. Why not try again? I retraced my steps up the double hairpin (going up without putting a foot down is a future project, by the way), waited for a couple of cyclists to pass by, and set my sights on another attempt. And? I made it again. My right hairpin curve success was no fluke! It was a true skills triumph. In a surreal way, it reminded me of learning to ride without training wheels. No one witnessed my foot-free bend around those curves, but even if they had, most likely they would not have understood how much this simple act– yet not simple to me– meant. 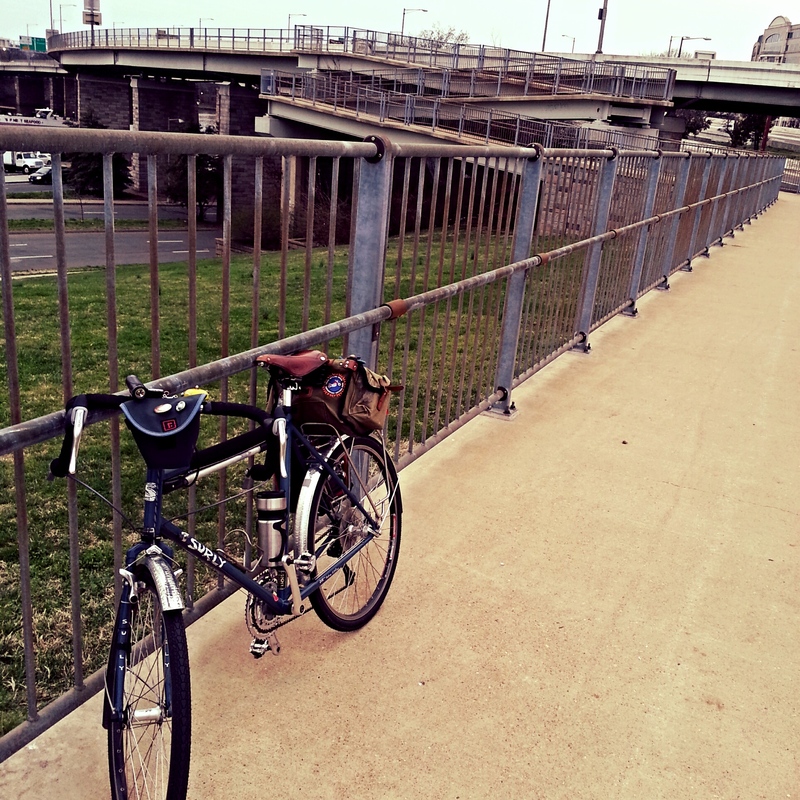 My heart swelled and I silently pedaled the rest of my way home, proud of what my bike and I had accomplished together. It’s not every day we grumpy grownup bike commuters experience an unexpected triumph. How lovely it is to savor. Eep! Hope you heal quickly and fully! Congratulations. I took that same double turn twice a day for years and years and it took a long time to master it. I even got to the point where I could maneuver Big Nellie, my long wheel base recumbent, around the two curves. It’s all about Felkerino’s wide turn, giving the outside pedal a power push at just the right moment, and trusting that physics will win the day. Yeah, science! Loved it! Sometimes it’s the smallest things. It’s great to be able to do something today that one couldn’t yesterday. I agree! I think one of the differences when I made both hairpins was that I was looking ahead and not down at my wheel AND I decided to trust my bike (and my bike handling :)). Indeed, we all have our own challenges that turn into sweet private victories. In this case, you shared yours, and we can all relate to the satisfaction of it. Thank you. I get the comment about riding being the best part of the day. My commute is decent but I get the shoalers getting in front of me, the salmoners coming at me, the people speeding past me at red lights. It’s enough to not want to be seen as a cyclist. And then there are the cars … wait, I think I still want to be a cyclist. Couldn’t face it going up hill (going north) but decided to do it going south, after a dental cleaning, Maybe have shinier teeth helped. Facing challenges is always worth it, as long as the cost of failure isn’t overwhelming. Oh, if you think shinier teeth helped with your hairpin turns, then I’m definitely going to attempt these going uphill right after I visit my dentist. Shiny teeth are an unquestionable confidence booster! I did these downhill – they looked too tough on the uphill route before cleaning. Congratulations on skill development. I’m commuting 50 kms a day and lately it has been a chore. So I wondered and came to a conclusion that I might be overtraining (with 150 kms at the weekend). Congratulations on your mileage, although it is also good to make sure to rest the body when needed. For me, it is not overtraining. I think it’s just a feeling of being tired of the whole routine, which happens to me every once in a while. These are so handy… I will put them to use right away so that I can finally start winning my commute!